There was a good turn out for the Annual Parish Meeting on 10 March. Speakers, Neil Burns of Southern Water and Tim Kermode of the Environment Agency explained that the sewer was overwhelmed by ground water at the start of January. The pumping station opposite the Plough couldn't cope with the result that a sewage lake formed on the school playground and field. They blamed householders whose drains are leaky and allow ground water into the sewer when the water table is high or who dispose of surface water into the sewer. The situation was brought under control by tankering and a bypass pump but the same thing happened again a couple of weeks afterwards. Questions and discussion left the speakers under no illusions that parishioners would tolerate this happening a third time. They felt that the water company should improve the system so it copes with the peaks and that they should have preventive arrangements in place when the water table is high and heavy rain is forecast. They were also concerned that the water on the school field reached its highest level in May in the previous floods in 2001 and wanted reassurances that the Environment Agency would ensure that the weed cutting programme was designed to prevent a recurrence. Luckily, rainfall in March has been below average which will reduce the chance of further floods. The meeting then heard the annual reports. Chairman Jeremy Barber said that the Parish Council has been very active. The cemetery and playground are looking good and the new skate ramp, built after a huge community fund raising effort, is very popular. The grindstone has been restored and the Jubilee party was a great success. The chairman thanked all the councillors and members of committees and the clerk for their hard work during the year. The accounts were approved. Mary Jo Darrah reported that the school was doing well and had achieved Investors in People status. The bid for funds for improvements to the school and playgroup was being considered and the outcome should be known around the start of April. Report on Sandra Gidley, our M.P. Sandra Gidley the M.P. for Romsey and the surrounding areas came in to talk to Chaffinch Class of Longparish School about her job . First, the children asked Mrs. Gidley questions about what it was like in the Houses of Parliament. An interesting question was Do you get free food in the Houses of Parliament? Her answer was no! Another question asked by two gamekeepers daughters, Charlotte Clay and Katharine Graham, was What are your views on fox hunting - should it be banned? Then Daniel Huckle asked Should our troops be brought back from Iraq? Mrs. Gidley had mixed feelings on this issue and explained them to us. 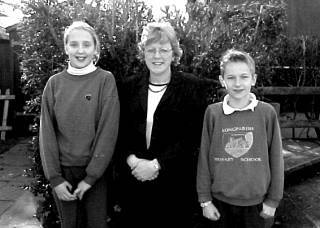 Then at the end Ellen and Olivier had their photo taken with Sandra Gidley. We are now planning to visit Mrs. Gidley at the Houses of Parliament in the summer term, an experience we are looking forward to.